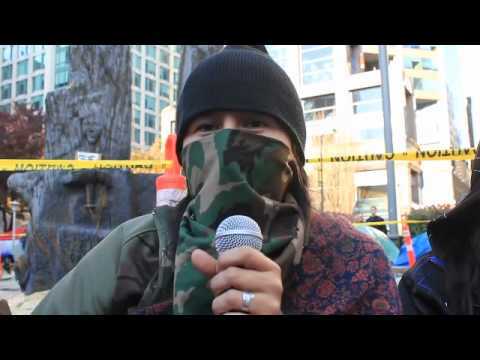 Just one day after the tragic death of Ashlie, a resident of Occupy Vancouver, and just hours after Mayor Robertson called for the end of the camp, the mood at the Vancouver Art Gallery was mournful, yet defiant. That energy carried on through the day as hundreds of protesters joined with indigenous people to oppose destructive mining practices on their territories. The Second Indigenous Assembly Against Mining and Pipelines called for the rally to coincide with a pro mining conference organized by the Canadian Aboriginal Mining Association.